Comments: Deciduous broadleaf native to California. Bright magenta flowers in spring, Bright green round to kidney shaped leaves (3" dia.) and abundant seed pods which redden and persist on the tree through winter. 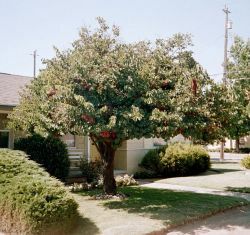 A large bush to small tree; specimen tree is about average at 10'. 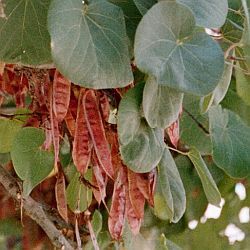 Tree is a member of the Fabaceae (pea) family and the seeds were eaten by western Indian tribes.